Life is filled with mishaps, missteps and dangers. Some we can anticipate, some that come as shocks. Every day, we read of people dying in accidents, shootings, terrorist attacks and, unless we know someone involved in the event, our day continues. How does one react when the tragedy hits close to home? There is certainly an immediate reaction (anger, sorrow, silence, tears) yet we try and move on. 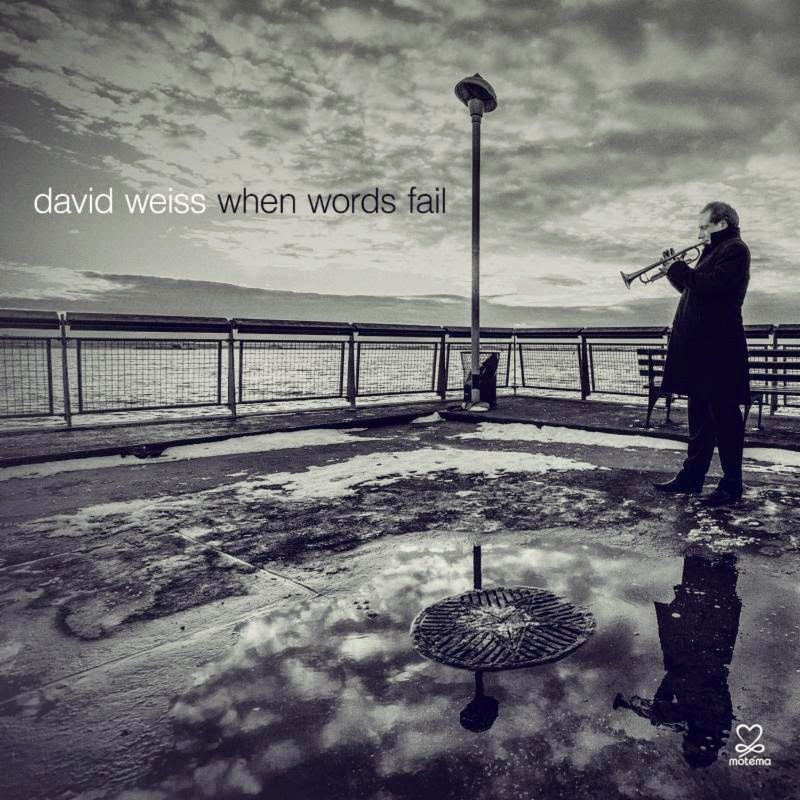 "When Words Fail" (Motema Music), the new recording from trumpeter/composer/arranger David Weiss, is one artist's attempt to deal with loss (losses). In the year leading up to the sessions for this CD, there was the Sandy Hook massacre (where his friend and fellow musician Jimmy Greene and wife Nelba lost their daughter Ana) and a long-time acquaintance was pushed onto the subway tracks by a person who thought he was a Muslim. Add to that the number of musicians who passed away; Weiss was often distraught and torn. He channeled his emotions into this music. To play these compositions (6 originals and 1 each by John Taylor and Karl Jenkins), Weiss reconvened his sextet, an ensemble that had not worked together in nearly a decade. Saxophonists Myron Walden (alto) and Marcus Strickland (tenor), pianist Xavier Davis, drummer E J Strickland and bassist Dwayne Burno make up the group with guitarist Ben Eunson (misspelled "Eunsen" on the CD cover) appearing on 2 tracks. Just 2 weeks after the session, bassist Burno passed away after a long battle with kidney disease. This music does not wallow in pity or melancholy. Yes, there are moments of introspection on the title track and elsewhere in the program but, mostly, this music looks forward. In fact, "The Intrepid Hub", the first track on the disk, burns with an intensity that Weiss picked up from his years working with Freddie Hubbard. E J Strickland really pushes the group while Burno keeps the rhythm flowing. Weiss dedicates the title track to the bassist, not only because of his loss but also because the bassist complimented him on the piece. Walden's alto work stands out because of how he enters into the rhythm of the piece, reacting in melody to the force of the piano chords, the drive of the drums and the thick bass lines. The leader builds his solo logically and with growing intensity. Walden takes center stage on "Wayward", a piece that has a long introductory theme played by all that gives way to the alto solo. After his wailing notes fade, Davis steps out for a solo that pushes back against the waves created by his partners in the rhythm section. The handsome melody and performance of "Loss" is dedicated to Motema label head Jana Herzen whose father passed in the months before the recording. "White Magic" is a piece composed by British pianist John Taylor for a 1973 trio Lp; here, it's a hard-swinging piece that features strong solos from Strickland (tenor sax), Weiss, Walden, and Davis. Karl Jenkins, who many remember as a member of the British "progressive jazz" ensemble Soft Machine, composed "Lullaby For a Lonely Child" in 1969 as a member of bassist Graham Collier's Sextet - the piece sounds influenced by Herbie Hancock and Horace Silver. The theme section is long and Weiss's group takes its time getting to the solo section. Walden's solo builds to a mighty crescendo, not so much a lullaby as a lament. The closing track, "Passage into Eternity", comes from a missive that Ana Marquez-Greene's family wrote soon after her death. Instead of a dirge, the piece seems to take the strong faith that the family has and creates a shout against the darkness - not a scream but a defiant stand against the evil that wears so many guises. "When Words Fail" is when music can stand in as a salve for those of us who stand by and feel hopeless. This music is filled with hope, with sorrow, even with joy. David Weiss has created music to remind us that pain, like joy, is fleeting, that we must cling to good memories and that imagination can be a powerful emancipator. The musicianship throughout is impressive and impactful. For more information, go to www.davidweissmusic.com. The country of Haiti is one that has suffered much over the past 2 centuries. The most successful slave revolt in the history of mankind (1791-1804) made the country the first Black republic in the world; they have paid for the freedom with a series of reprisals from the European and American monarchies and governments as well as a series of natural disasters and corrupt leaders that continue to wreak havoc on its economy. In 2012, pianist/composer Bobby Avey, a native of the Poconos Region of Pennsylvania, traveled to Haiti to study its culture and, specifically, the Vodou traditions. 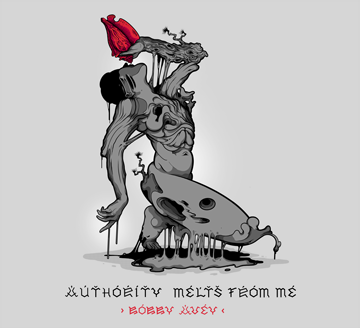 After a period of deep listening and analysis of several drumming ensembles, Avey created "Authority Melts From Me" (Whirlwind Recordings). Instead of organizing his own drum ensemble and recreating the sounds he had heard on the journey, the pianist recruited Miguel Zenon (alto saxophone), Ben Monder (guitar, acoustic guitar, effects), Thomson Kneeland (bass) and Jordan Perlson (drums) to play his music based on his studies and celebrating the revolution. The results are quite impressive. The 5 compositions include 3 long works plus a short piano interlude (hushed, rippling, phrases) and short drum interlude (forceful). Everyone plays wonderfully throughout but extra special kudos go to Perlson. His authoritative work on the trap set and assorted percussion drives the longer works, setting the pace, signaling changes and representing the force of the will of the people. Avey's piano work is often quite percussive but also richly melodic. He leads the ensemble in on the opening track, "Kalfou" (translates to "intersections" or "crossroads"), then sitting out for Monder's raucous spot before offering thick chords for Zenon's high-flying solo. In the meantime, the rhythm section are raising the intensity level. "Louverture" (dedicated to the leader of the revolt), creeps in on percussive figures played high up on the keyboard. Perlson and Kneeland advance the melody line before Zenon enters with his own melody - his solo starts quietly, short melodic fragments that soon give way to longer phrases, like declarations of intent as the drummer stokes the fire. After the alto solo reaches its climax, the rumbling piano combines with looped guitar feedback to create a dream-like state. Several minutes later, the rhythm section enters with a martial beat before the rhythm takes on a "vodou" feel. The final long track, "Cost", begins at the end of the "Drum Interlude"; the melody, as played by alto sax and piano, has a formal feel while the guitar, bass and drums swirl like a hot wind below it. The piano solo rises out of the melody and above the swirling drums and forceful bass lines. Monder picks his way through the piano lines as a quiet interlude before Zenon enters. His solo starts with short, percussive, phrases that soon take off on the power of the rhythm section. After a long crescendo (Monder on electric here), the piece fades out on finger-picked acoustic guitar and piano. "Authority Melts From Me" is, indeed, powerful music with a message about the costs of freedom and the perils of foreign neglect and/or intervention. In his liner notes, Bobby Avey reminds us that the United States is not innocent when it comes to the current state of affairs in Haiti, supporting the dictators Duvalier (father and son) as well as helping to overthrow the popularly elected government of Jean-Bertrand Aristide in 1991 and, again in 2004. Then, the earthquake of 2010, the outpouring of support and money, much of which did not reach the people who needed it the most and another long, slow, recovery. The music does not sweep away the misery but acts as a reminder of the power of native traditions in the time of upheaval. For more information, go to www.whirlwindrecordings.com/authority-melts-from-me/ and/or www.bobbyavey.com.